My child was fighting at school! Well.. This is a tough one. We all know what the politically correct thing to say is but …Is it that big a deal and should your child be disciplined for it? Each year, many parents have to grapple through the phone call where the principal or teacher starts to diarize what transpired before their child inevitably decided to give the other child a good a**###kicking. It usually goes like this. .. “Your child is a good kid” but this can’t happen at our school”. Fighting at school is a no no! Then your child comes home, and gives you his interpretation of what transpired before the blow out. You hear him out, and you reflect on the circumstances objectively, at least you try to. At the bottom of your gut, you conclude that your child was not in the wrong to defend him/herself but in the same breath, you don’t want the principal or teachers thinking you’re promoting violence or aggression. What to do????? Conflict in general doesn’t have to be a bad thing. For the sake of maintaining control and avoiding lawlessness in our communities, the general consensus in most schools is that fighting won’t be tolerated. If you receive the phone call that your child has been fighting at school, there are steps you can take to ensure you‘re being the responsible parent. It’s really important to find out the facts about what happened before jumping to any conclusions. Who started or instigated the fight? Were there other kids around when the fight was happening? Were there other kids who were part of the fight? Who got injured and to what degree? Was there a history between your child and other child- or was this a one-off? It’s important to find out the facts so the right message can be passed to your child. What you tell your child at this age goes a long way into establishing belief systems about conflict in general. Get the full story before uttering a word! Ultimately, we want our children to feel confident, defend the right causes but in the same breath, allow the powers that be E.g. Teachers etc to intervene when conflict arises. This can become complicated in a generation where children don’t believe in snitching and will tolerate being bullied and abused by someone until they ultimately lose it and do something out of the ordinary. The culture of “No snitching” plays into whether you’re accepted in peer groups, whether you can be trusted, and so forth. Sometimes, real problems are taking place on the playground and the only person who knows- is the victim and the perpetrator. Parents need to evaluate their own stance on snitching and have a conversation with their children. Encouraging your child to go a teacher in confidence (e.g. Afterschool) – if they are concerned about other kids seeing them report bad behavior. 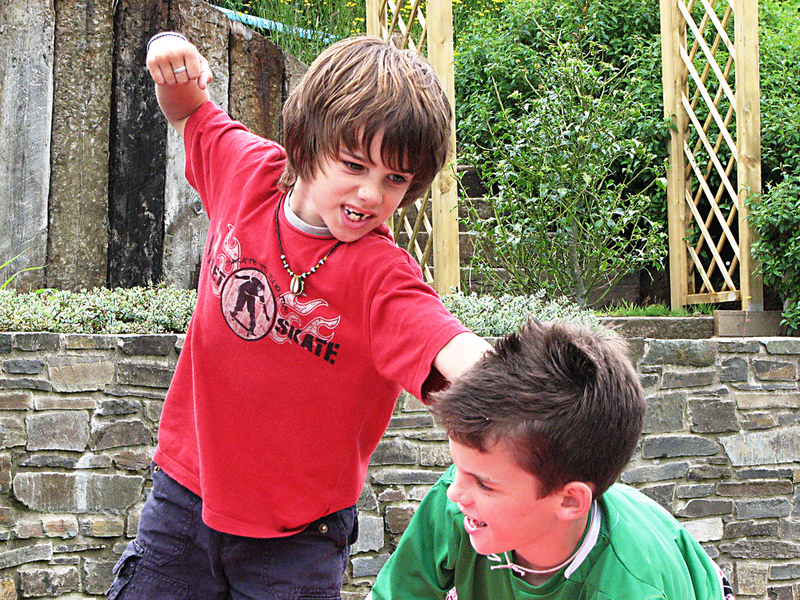 Giving your child anger management skills if they are highly sensitive or easily provoked. The saying “It takes a village to raise a child” has many implications. One being, that every child is your child. We should be just as concerned for the other child as we are for our own. Ultimately, they‘re all kids and they don’t know any better. When children get into conflict, they are teachable moments for everyone and it can be used to hone virtues and character. However if we make it personal, and defend our own, and or become offended in the process because a principal or teacher has mis-stepped, we could lose the opportunity to teach our children some very important lessons. We do this not because our child is wrong or right but we are modeling for them what happens in real life when we use our hands on someone –whether an adult or child. Our goal is to prepare our children for the real word and providing consequences for being aggressive- is the real word. You hit someone- you go to jail and they need to know this. As a parent, it’s your responsibility to mimic the realities of this life.